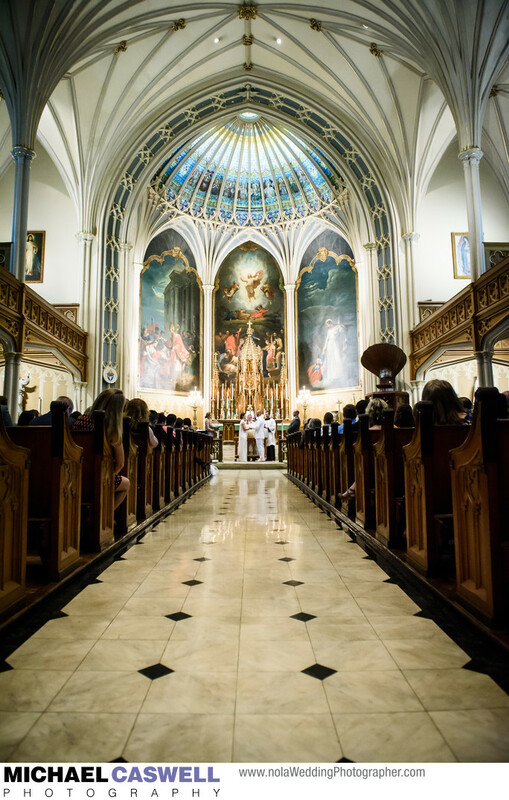 Old St. Patrick's is 185 foot high Gothic style structure that was built around 1840, making it one of the oldest Catholic churches in New Orleans. Though St. Louis Cathedral predates it by about 50 years, the Cathedral was expanded and rebuilt about 10 years after St. Patrick's was built, with very little of the original structure being retained, while St. Patrick's, though being extensively restored in the latter part of the 20th century, still looks essentially the same as it did when it was first constructed. The interior is awe inspiring, featuring beautiful murals behind the altar painted by artist Leon Pomarede, gorgeous stained glass, and countless other details. A pleasure to photograph weddings at, it's a wonderful choice for brides and grooms, with numerous outstanding reception venues in the immediate vicinity of the church. The Lighthouse Building, which is where this couple's reception took place, is literally steps away from the church on Camp Street. Historic Gallier Hall is just around the corner on St. Charles Avenue, the elegant Loews Hotel and Le Pavillon are both right down Poydras Street, and New Orleans Board of Trade is fairly close as well. Also nearby are some fabulous Warehouse District venues, such as The Chicory, Restaurant August, Tomas Bistro, and Generations Hall. A little further out, but still within easy distance of a Second Line Parade, are the Roosevelt Hotel and Federal Ballroom, with several French Quarter venues also being within walking distance and more being just a quick bus ride away. Location: 724 Camp St, New Orleans, LA 70130.